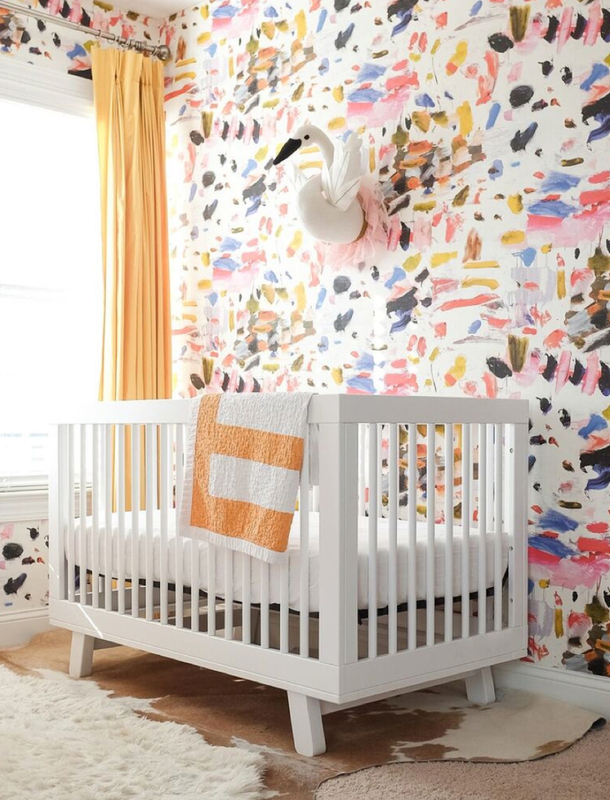 Baby Fever: 5 Nurseries We Love - Genue Inc.Genue Inc.
Who doesn’t love a good before and after transformation? When Stacey Blake started working on the design for her baby girl’s nursery, she was inspired by one thing: this beautiful wallpaper from La Maison Pierre Frey. It’s bright and colorful and, once on the walls of the dormer, becomes extra warm and cozy with the sun streaming in from the window. What a fun and beautiful space to grow up in! Make sure you read the full post to see the full transformation! What if a little boy is in your future instead? We love the sweet and simple baby boy nursery from Liz Adams of Hello Adams Family. 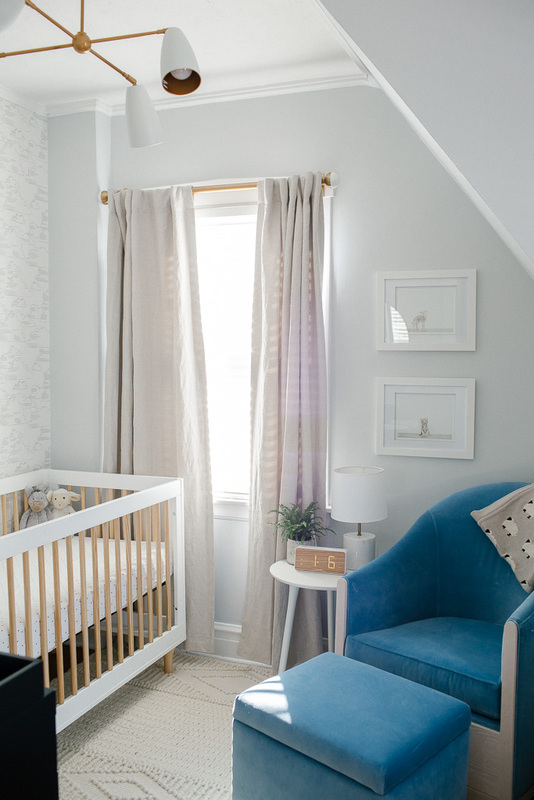 Even though it’s a small space, keeping everything simple and serene—with touches of blue and lots of texture—creates a calm and inviting space for both baby and the parents. I love the little lamb details! Truly one of the most extraordinary surprises is waiting to find out the gender of your baby. But how do you design for the unknown? Just ask Emily of Table & Hearth, because she nailed it with her calm and coastal gender neutral nursery. The beachy vibes remind me of the calm of the ocean—which is exactly the kind of feel you want in a nursery! I love the weathered textures, and the many DIY touches, like her stunning driftwood mobile and how-to guide for installing a farmhouse barn door. But sometimes it’s impossible to have a dedicated space just to call the nursery, and you’re presented with an opportunity to carve out a nursery space within a larger space. 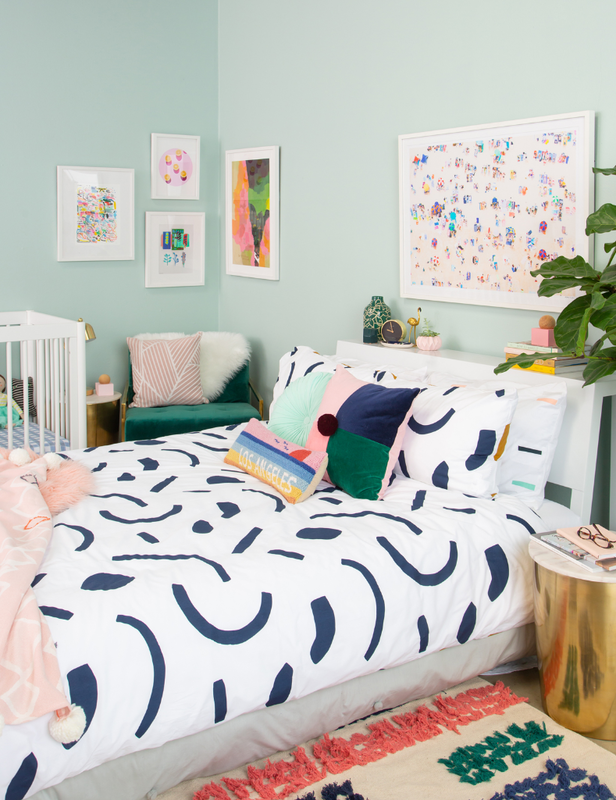 Joy Cho, of Oh Joy, and her team show a few ways to create nursery space in a Master Bedroom, while still making sure that everyone has their own space. Joy recommends utilizing a cohesive aesthetic throughout the whole space and making sure everyone has their own storage space. Maybe your children now will be sharing a space, and you get a chance to integrate nursery elements into an older child’s room. Sharing space can be wonderful for fostering relationships, and Joanna Goddard of Cup of Jo’s boys’ room does just that. Designed by Emily Henderson, the room is warm and bright, but also fosters playtime and imagination. Emily used low bookshelves that the boys could reach themselves for optimal exploring and imagining.